Since Tuesday there have been 54 water main breaks because of the cold weather, and the Detroit Water and Sewerage Department believes that number will go up. None of those water main breaks have been fixed because it is too cold outside for works, instead the water has been turned off but no ones water supply is impacted. 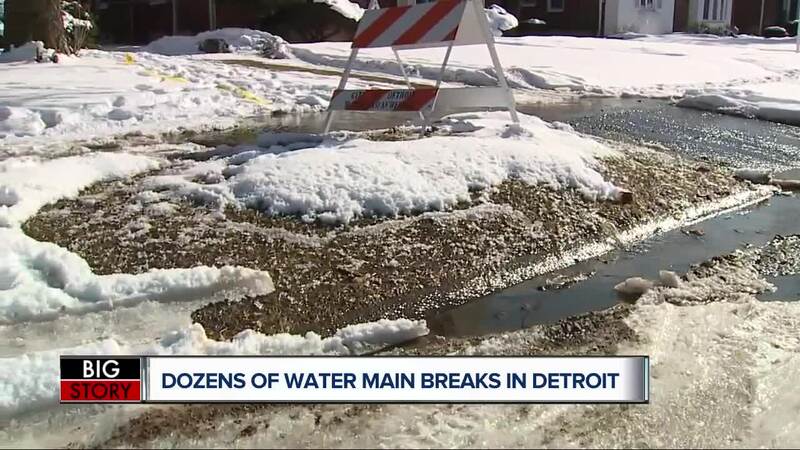 DETROIT (WXYZ) — Since Tuesday there have been 54 water main breaks because of the cold weather, and the Detroit Water and Sewerage Department believes that number will go up. None of those water main breaks have been fixed because it is too cold outside for works, instead the water has been turned off but no ones water supply is impacted. “We’re out there chipping away the ice and salting it down,” said Gary Brown, directors of the Detroit Water and Sewerage Department. Brown says they plan on fixing all the water main breaks once the weather warms up this weekend. That being said, the dramatic change in weather from cold to warm might impacted the water lines. “What causes the most damage is the shifting in soil from temperature change,” said Brown. Brown says they do have a plan in place for the warm up. “We’ve got all hands on deck with moving personal that would normally be working on sewers or working on meters or working on general maintenance we’ll shift them over to the water side of the house and put all hands on deck to get theses water mains repaired,” said Brown. If you spot a broken water main, call the Detroit Water and Sewerage Department at 313-267-8000.